April 14-20, 2013 is National Library Week, and I’ve been saving up some etegami and quotations for it. Today’s card: “Outside of a dog, a book is a man’s best friend. 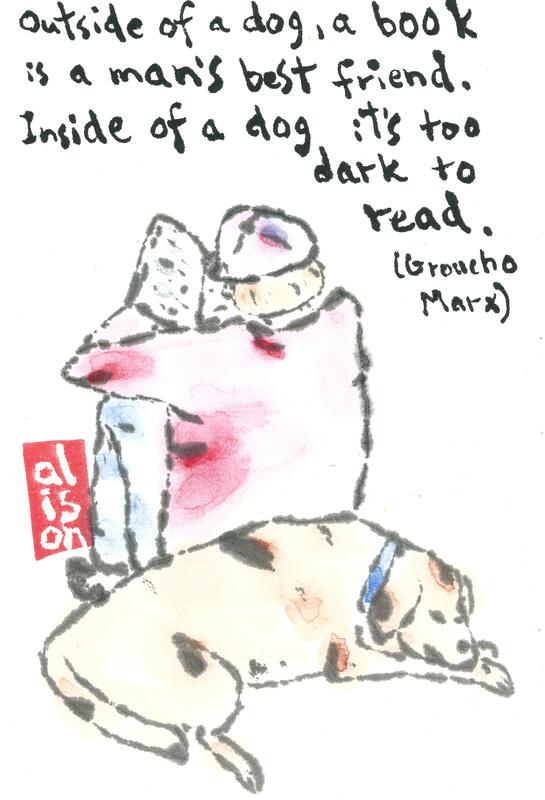 Inside of a dog, it’s too dark to read” — Groucho Marx. I’m not a “traditional” “stereotypical” librarian, as I work in data research and acquisition, and not at all in books or other print media. Outside of the profession, a lay person might not think what I do is library work, but it is integral to the work of my researchers and my employer, and it really is just an expansion of library skills (research, selection, evaluation, cataloging, outreach) beyond the book and into data, whether it’s semiconductor outlays or mortgage refi data. However, the number of semiconductors produced in a quarter, or the amount of mortgage refis since the financial crisis do not lend themselves well to etegami, at least at my skill and creativity level. So, the etegami I’ll post over the next week will feature more of what you might associate with stereotypical library work — books and novelists. I’ll see if I can wrack my brain and come up with a lovely card on semiconductor factory output, but don’t hold your breath. Thanks! Which one… the one with the dog, right?